Our poor anonymous centurion friend. He was perfectly content being dead, moldering away and not bothering anyone. Out of nowhere, Zeus appears, all beardiness and thunderbolts-to-the-face fury, to resurrect him. Why? The god has a quest for us: to descend into the underworld and rescue his kidnapped daughter from the villainous Neff. Why one of his non-dead underlings wouldn’t have been a better choice for the task, I can’t imagine. I suppose you just can’t get the staff any more. So, anywho, this is the rather succinct plot of Altered Beast, the legendar(ily crap)y arcade brawler from 1988. You could call it a classical Golden Axe or Streets of Rage, but it’s older than both so… you couldn’t at all really. Stop your filthy lies, filthy liar. Still, the general idea is much the same. As the centurion, you will progress through a series of stages, each adorned with the columns and caverns and such you’d expect of its setting. You’ll walk from left to right, punch things in the face, and kick things in the face. This being the underworld, though, said ‘things’ take a rather more macabre approach. Zombies, demons and other winged horrors will oppose you. But fear not, because you’re more than equipped to deal with them. Our impetuous hero can collect magical orbs from destroying certain enemies, which power him up no end. In fact, they are the source of the game’s notoriously terrible POWER UP! soundbite. When our hero suddenly and instantaneously spouts biceps like Popeye does, you know the monsters down below are about to have a bad time. Particularly so when he collects three of them, and unleashes beast mode. This is an animal transformation, unique to each stage, which bolsters your power and gives you a new attack or two to work with. A werewolf, a dragon and a big ol’ magical bear-thing are among them, and you can’t defeat the end boss of each stage without their services. Literally, the level will simply continue on if you’re in your regular muscular-dude-in-speedos form. 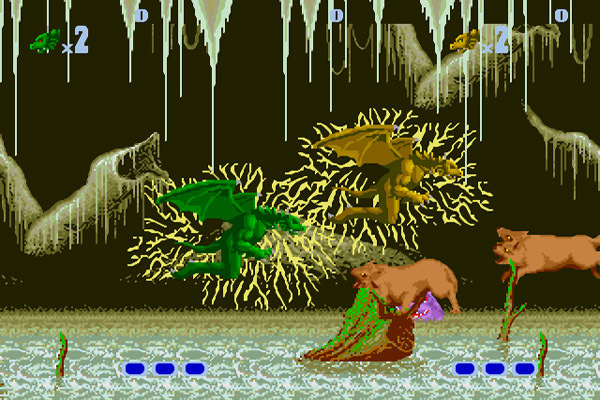 There’s nothing particularly remarkable about Altered Beast’s gameplay. It’s just another early scrolling brawler, the kind that the Mega Drive was crapping out on a daily basis back in the day. Nevertheless, there’s an unmistakable allure to the game. Perhaps it’s the hilariously, cringe-ily bad voice acting (WIZE FROM YOUR GWAVE!) that cements its timeless appeal. Perhaps it’s the delusions of grandeur: not since Columns has a video game had such a fancy classic aesthetic for no reason at all. 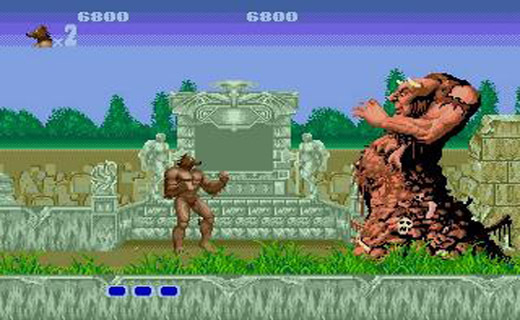 Whatever the case, though, the fact remains: It’s hard to say whether Altered Beast is remembered particularly fondly or not, but it is remembered. That’s enough, really.